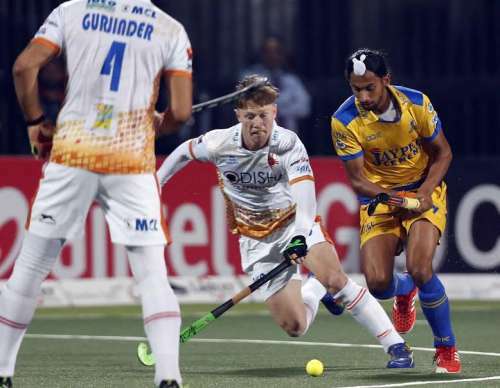 Jaypee Punjab Warriors’ hopes of defending the title in front of their home crowd in the fifth edition of the Coal India Hockey India League practically ended as they lost their second successive match on home turf here on Saturday. The visiting team Kalinga Lancers, playing their last league match, walked away with a 7-0 triumph to seal their spot in next week’s semi-final on 25 February in Chandigarh’s Hockey Stadium. Kalinga Lancers have been one of the most consistent teams in the league this season and they continued their good show by getting a lead early in the game. It was skipper Moritz Fuerste who created a PC in the 9th minute of the match but a missed trap by Adam Dixon almost seemed like the chance went begging. But Dixon was quick to make up for the error by fetching the rebound, only to ambitiously drive into the striking circle beating defenders Mark Gleghorne and Varun Kumar to send a fiercely struck ball past in-form keeper Tristan Clemons. The visitors ended the first quarter with a strong 2-0 lead. When the two teams met earlier in the league in Bhubaneswar, Kalinga Lancers enjoyed a narrow 6-5 win against Jaypee Punjab Warriors. The visitors executed their plans to perfection today, making their intentions of winning the match strong and clear in the second quarter which saw both teams trade PCs. While Jaypee Punjab Warriors couldn’t convert a goal from the seven PCs they earned this quarter, Kalinga Lancers put one past Clemons in the 24th minute. It was German stalwart Moritz Fuerste who was responsible for extending the visitors’ lead to a comfortable 3-0 when he successfully converted his 7th PC of this season. Kalinga Lancers forward Lalit Upadhyay further dented Jaypee Punjab Warriors’ hopes of making a comeback in the second half when he improvised an assist from Billy Bakker to extend his team’s lead to 5-0 with an attractive reverse hit. The Jaypee Punjab Warriors seemed like they had completely lost the plot, their defensive errors left exposed, as Kalinga Lancers went on to score yet another field goal in the 39th minute when Dharamvir Singh deflected the ball into the post after a good assist by Malak Singh from within the circle. With a formidable 7-0 lead, the Kalinga Lancers looked poised for a win in the final quarter by defending their lead rather diligently. Though the home team won two PCs this quarter, they couldn’t make much of the opportunity. The home team's forward SV Sunil converted a field goal in the 56th minute, but a video referral in Kalinga Lancers’ favour denied them the consolation. Adam Dixon of Kalinga Lancers was awarded a prize money of Rs 50,000 for scoring the Coal India Goal of the Match from Ms. Shantilata Sahu, Director Personnel, Northern Coal Fields Ltd.
Matthew Dawson of Kalinga Lancers won the prize of Rs 25,000 for being the Hero Young Achiever of the Match from Mr. Balbir Singh Senior, three-time Olympic gold medalist. The Airtel Most Entertaining Player of the Match was awarded to Lalit Upadhyay of Kalinga Lancers that came with a prize money of Rs 25,000 and presented by Mr. Debasis Das, General Secretary Coal India Sports Promotions Association. Dharamvir Singh of Kalinga Lancers was declared the Man of the Match and was awarded a prize money of Rs 50,000 by Mr. Inderjeet Vinayak, Senior Vice President Jaypee Cement. On 19 February, Delhi Waveriders will take on Uttar Pradesh Wizards at the Shivaji Stadium in New Delhi at 1900hrs.